No matter how many times I have seen it, Florence’s cathedral continues to impress me, and for many reasons. The Duomo is simply huge, with a length of some 153 metres and a nave width of 38 metres (90 metres at the crossing). It can accommodate at least 20.000 people. When it was consecrated in 1436, it was the largest church in the world. Its facade is beautiful and elegant, although many people do not realise it is a relatively recent addition. 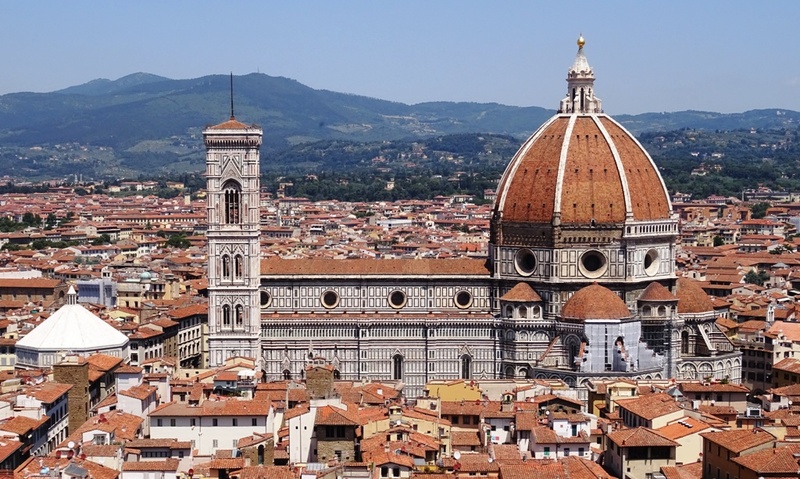 The building has the most ingenious dome in all of Florence, the work of the great architect Filippo Brunelleschi (1377-1446), and visitors can climb up all the way up to the lantern to get a panoramic view of Florence and the hills surrounding the city. Giotto’s freestanding campanile offers about the same view. 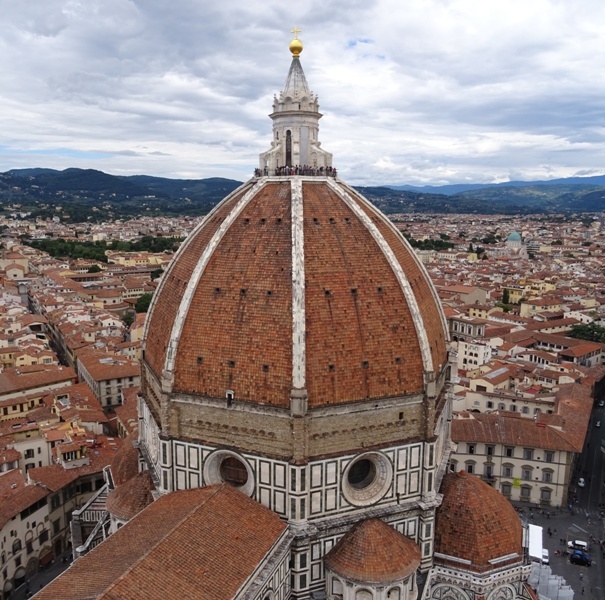 It is slightly lower than the dome, standing at a height of 84.7 metres, but it comes with a bonus: from it, one can see Brunelleschi’s dome in full glory. By the end of the thirteenth century, Florence’s early medieval cathedral, the Santa Reparata, was considered much too small for the thriving city. By 1294, the decision had been made to replace it with a much larger and much more beautiful new cathedral. 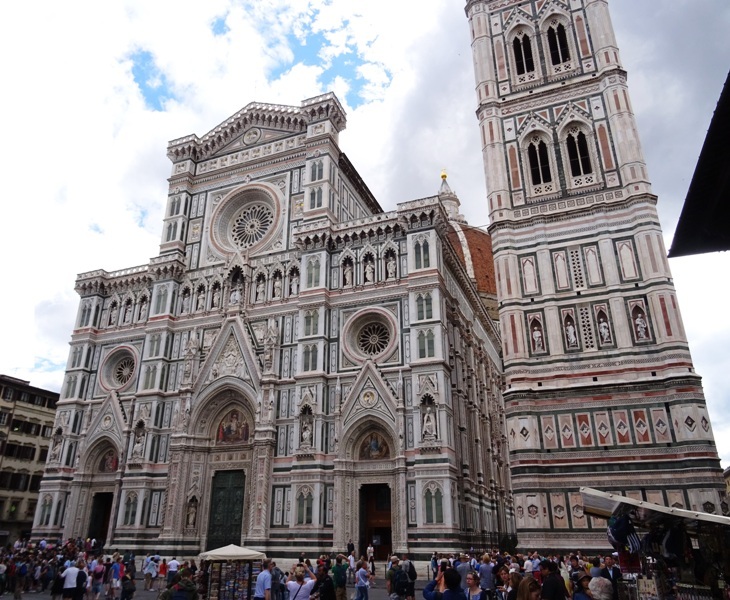 Work on the Santa Maria del Fiore – the full name of the Duomo – started in 1296. The job was entrusted to the architect and sculptor Arnolfo di Cambio. Since Di Cambio died somewhere between 1300 and 1310, things did not get off to a quick start. Work may have even come to a complete halt after his death. In the 1330s, the powerful wool guild (Arte della Lana) took over the project and Giotto was appointed as chief architect. This may come as a surprise, since Giotto (ca. 1266-1337) is primarily known as a painter. We should remember, however, that most artists in those days were polymaths and worked as painters, mosaicists, sculptors and architects all at the same time. Michelangelo, for instance, considered himself first and foremost a sculptor, but was commissioned to paint the ceiling of the Sistine Chapel nonetheless. Giotto would certainly have been proficient in the field of architecture, but he seems to have worked primarily on the campanile, which is usually named after him, but was only completed in 1359, some 22 years after his death. The Duomo, seen from the Palazzo Vecchio. Giotto was succeeded by Andrea Pisano (ca. 1290-1348), who was also responsible for the first set of bronze doors of the Baptistery. He was in turn succeeded by the Florentine architect Francesco Talenti, who made major changes to Di Cambio’s design and significantly enlarged the cathedral. Giovanni di Lapo Ghini took over from Talenti in the 1360s, and a few more architects would follow before the building could be declared more or less completed around 1380. But it was not yet fully completed: the dome and the drum supporting the dome were still missing. This was quite a challenge, as the dome had to span an area some 44 metres wide. Di Lapo Ghini had wanted to construct a dome that was supported by flying buttresses, which were quite usual in Gothic architecture. However, these supporting arches were by now considered ugly by most Italian architects. One Neri di Fioravanti, also architect of the cathedral for some time, designed an alternative model without buttresses, which was chosen over Di Lapo Ghini’s design. However, it was never executed. It was not until 1418 that a competition was announced to design a new dome for the cathedral. Among the participants were Brunelleschi and his rival Lorenzo Ghiberti (1378-1455). Ghiberti had defeated Brunelleschi in a previous competition related to the construction of a second set of doors for the Baptistery, but this time Brunelleschi was victorious. There is a story, mentioned by Vasari, that he managed to convince the jury about his design by making an egg stand upright on a marble plate by placing it hard on the plate and thus damaging the lower end. The story is no doubt fabricated, but it has to be said that Brunelleschi’s dome does resemble an eggshell. The project to construct the dome was started in 1420 and it was completed in 1436. Brunelleschi was obviously a genius. He designed several hoisting machines to get all the building materials to a height of over 52 metres and created a double-shelled, self supporting dome which has stood the test of time. I am not an engineer and do not feel qualified enough to discuss all the technical details here. The full story of the dome is told elsewhere. When the dome had been completed, the Duomo could finally be consecrated by Pope Eugenius IV (1431-1447) on 25 March 1436, the first day of the New Year according to the Florentine Calendar. The Council of Florence took place here in 1439 (see Florence: Palazzo Medici Riccardi). Santa Reparata, the Madonna of the glass eyes and Saint Zenobius. Decoration of the facade was already begun in Arnolfo di Cambio’s days at the beginning of the fourteenth century, and the master himself may have sculpted some of the statues. For some reason, the facade was left only half-finished: only the lower portion was completed. In the sixteenth century, the Gothic style of Di Cambio and his successors was frowned upon, and Grand Duke Francesco I (1574-1587) had the facade removed by his architect Bernardo Buontalenti (ca. 1531-1608). Those of Di Cambio’s statues that have survived can now be found in the Museo dell’Opera del Duomo. 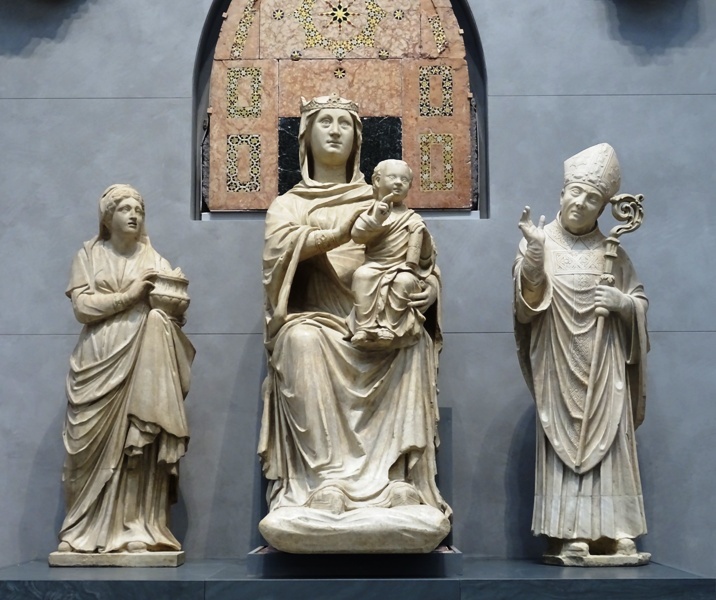 Among them is a statue of Pope Bonifatius VIII (1294-1303), as well as statues of the so-called ‘Madonna of the glass eyes’ and of Florence’s patron saints, Santa Reparata and Saint Zenobius, the traditional first bishop of Florence. Buontalenti would no doubt have been able to design and construct a wonderful new Renaissance facade for the Santa Maria del Fiore, but the problem was that others made designs as well and the Florentine authorities could not choose. In the end, the facade was left completely undecorated. Given the beautiful marble decorations on the outer walls of the cathedral – in white, green and pink – this must have looked rather poor. It was not until 1875 that work began to provide the Duomo with a splendid Neo-Gothic facade, designed by Emilio De Fabris (1808-1883), which was completed in 1887. All the statues and reliefs date from this period, as well as the decorations in the lunettes. The bronze doors were added somewhat later, between 1899 and 1903. 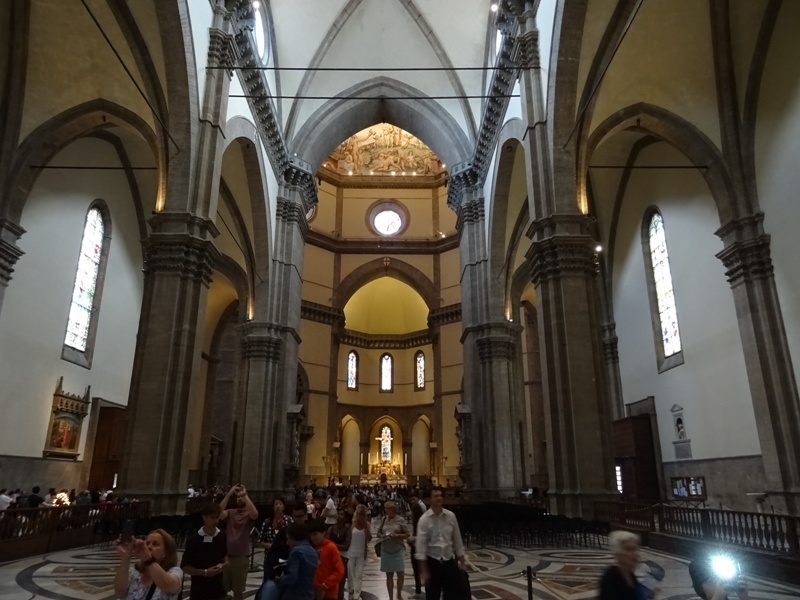 Upon first glance, the interior of the Duomo may seem a bit disappointing. It is very simple, Spartan even, with most of the walls and ceilings lacking decorations. The part of the cathedral comprising the octagonal marble sanctuary – by Baccio Bandinelli (1493-1560) – and the chapels is apparently off limits to visitors (perhaps it is accessible for those who wish to pray, but not for tourists). Fortunately, there are still a few precious works of art to be seen inside, although to get a complete picture, one has to visit the Museo dell’Opera del Duomo as well. For instance, the beautiful choir stalls (cantorie) by Luca della Robbia (ca. 1400-1482) and Donatello (ca. 1386-1466), once in the Duomo, were moved to this museum decades ago. Funerary Monument to Sir John Hawkwood. Funerary Monument to Niccolò da Tolentino. So what works of art are left to admire inside the Duomo? I first of all point to the left (north) wall of the cathedral. Here we find two funerary monuments that are actually frescoes transferred to canvas. The first is the Funerary Monument to Sir John Hawkwood (ca. 1320-1394), an English mercenary captain who fought in Italy during the fourteenth century. Hawkwood was credited with saving Florence against Milanese expansion and was therefore buried with state honours in the Santa Maria del Fiore. His funerary monument was executed in 1436 by Paolo Uccello (1397-1475). The monument forms a pair with another funerary monument, executed twenty years later by Andrea del Castagno (ca. 1421-1457). This monument commemorates the Italian condottiero Niccolò da Tolentino (ca. 1350-1435). 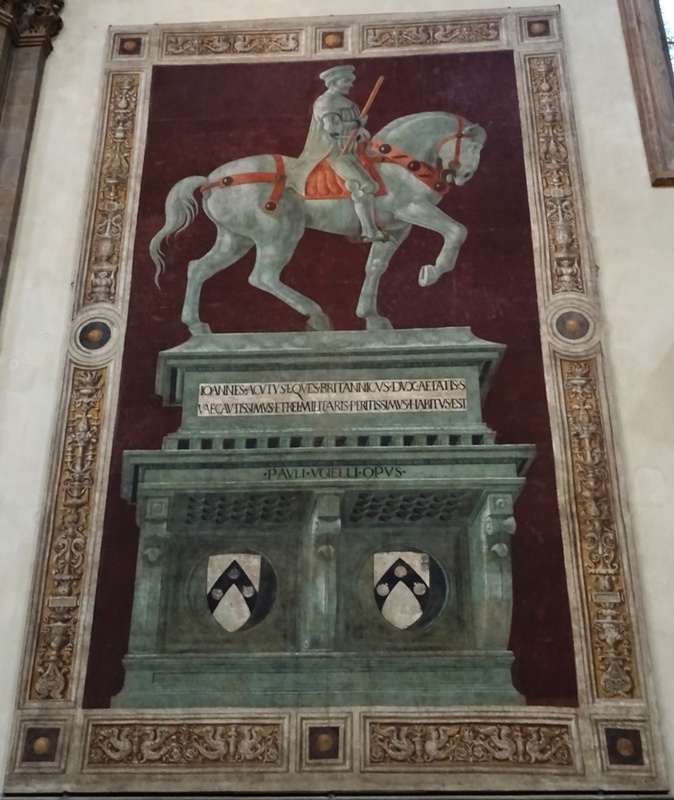 This mercenary captain lead the forces of Florence to victory over Siena at the Battle of San Romano in 1432, a battle that was immortalised in three paintings by the aforementioned Paolo Uccello. For his services to Florence, Da Tolentino was also buried in the Duomo. Dante by Domenico di Michelino. Also interesting is a painting of the famous poet Dante (ca. 1265-1321) by Domenico di Michelino (1417-1491). Dante is holding a copy of his Divine Comedy in his hands, and seems to be pointing at scenes from Hell on the left side of the painting. In the background, we see Mount Purgatory with Adam and Eve in the Earthly Paradise on top. On the right is the city of Florence, with Brunelleschi’s dome featured prominently. This is of course the Florence of Domenico’s days, not the Florence as Dante would have known it. To the left of Brunelleschi’s dome, we see the towers of the Bargello and the Badia Fiorentina, while to the right of it, the tower of the Palazzo Vecchio is depicted, as well as Giotto’s campanile. There is a smaller tower between these two which might be the lantern of the Baptistery. 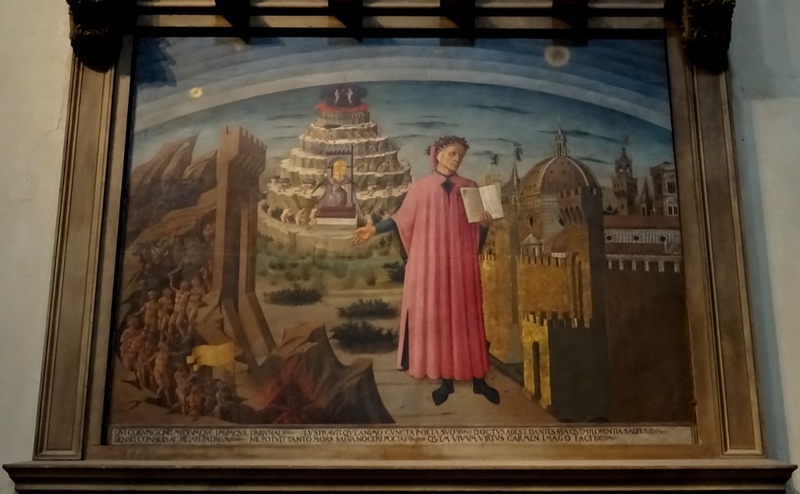 Note that Dante is painted standing outside the city, the city he had been banished from in 1302. Dante died nineteen years later in Ravenna and was buried there. The frescoes on the inside of the dome are perhaps the most impressive works of art in the Duomo. 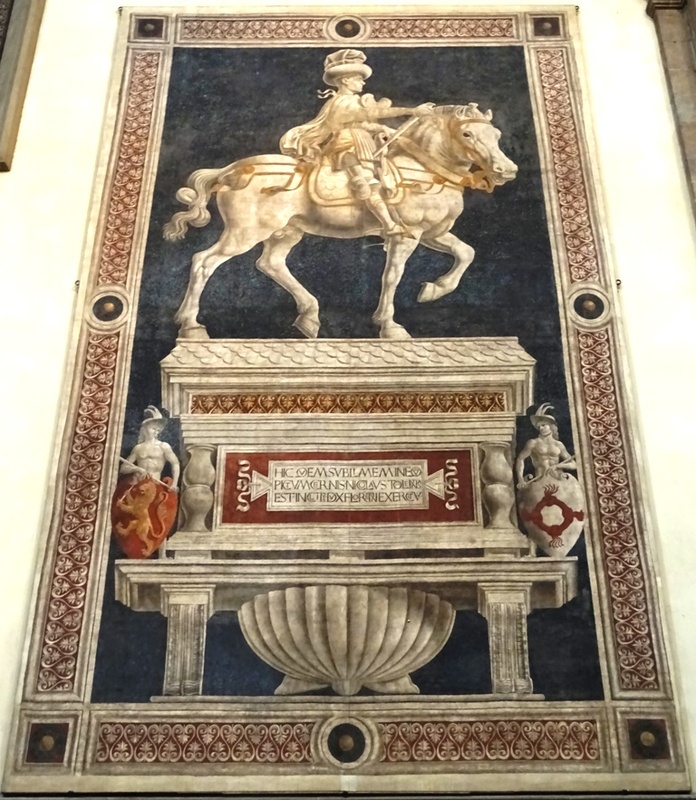 Originally the dome interior was not decorated at all, but Grand Duke Cosimo I de’ Medici ordered Giorgio Vasari (1511-1574) to fresco the entire surface, some 3.600 square metres. Vasari’s fresco of The Last Judgment is simply huge, and the artist died before it was completed. Federico Zuccari (ca. 1540-1609), who may have already been involved in the project, continued the work and finished the great fresco in 1579. One of the oldest decorations inside the Duomo can be found above the main entrance. Just below the huge clock made by Paolo Uccello, one can see a lunette with a charming mosaic of the Coronation of the Virgin. Several angels are depicted in the scene, and the symbols of the four evangelists – eagle, ox, lion, man – are present as well. Vasari attributed the work to Gaddo Gaddi (ca. 1240-1312), who was both a friend of Giotto and Taddeo Gaddi’s father. 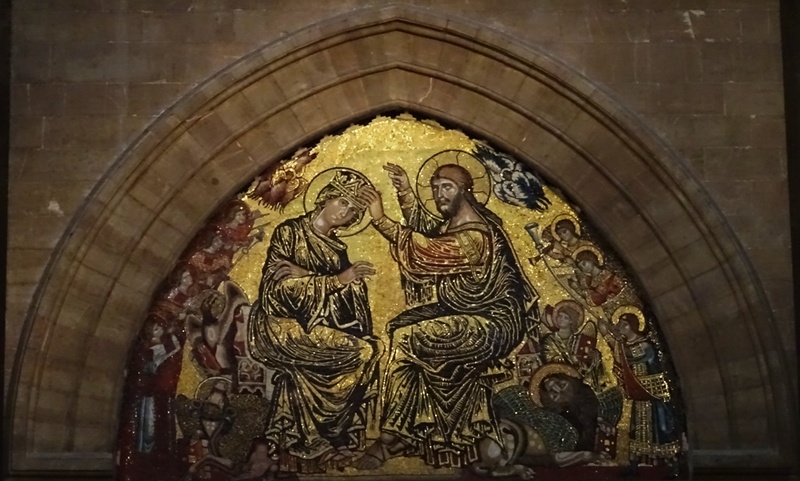 If Vasari’s attribution is correct, the mosaic was probably executed in the early 1300s. Coronation of the Virgin by Gaddo Gaddi. Sources: for this post I have used a variety of sources. I have made use of two travel guides, one by Dorling Kindersley about Florence & Tuscany and one by the Royal Dutch Touring Club (ANWB) about Florence. Another source was the Wikipedia entry about the Duomo and the website teggelaar.com was helpful as well. Whether it was actually a Florentine victory is disputed, but the Florentines themselves certainly saw it that way.